The following is the first of a two-part series that analyzes new Phase 1 ESA requirements and their impact on consultants and their clients. The second part is scheduled to be published in the November/December 2006 issue of Environmental Protection. On Nov. 1, 2005, the U.S. Environmental Protection Agency (EPA) published its Final Rule pertaining to the Standards and Practices for All Appropriate Inquiries (AAI). Shortly thereafter, ASTM International (ASTM, formerly known as the American Society for Testing and Materials) published its updated E 1527-05 Standard Practice for Environmental Site Assessments: Phase 1 Environmental Site Assessment Process. Much has been written about the new requirements and latest landowner liability protections (LLP's) that evolved as a result of Congress's actions and the new EPA Rule (i.e., the addition of the contiguous property owner (CPO) and bona fide prospective purchaser (BFPP) defenses related to liability under the Comprehensive Environmental Response, Compensation, and Liability Act (CERCLA or Superfund)). There is, however, one aspect of the AAI Rule and revised Standard that remains a source of substantial confusion. It lies within the very last sentence of the AAI Rule, wherein it states: "The inquiry of the environmental professional should include an opinion regarding additional appropriate investigation, if any." (Federal Register Doc. 05-21455, §312.31(b), Pg. 66,113). This directive is carried through to the new ASTM Standard, wherein it states, in part, "The environmental professional should provide an opinion regarding additional appropriate investigation, if any, to detect the presence of hazardous substances or petroleum products," (ASTM Section 12.6.1). The problem is that this language has been interpreted by many within the industry as guidance directing that recommendations regarding the collection of new data through, for example, sampling and analysis, is now appropriate (even mandated) as part of the completion of a Phase 1 environmental site assessment (ESA). Such interpretation is misguided and will have a profound impact on the commercial real estate industry, if not clarified. The position here is that if EPA intended to do away with the finality of a Phase 1 ESA (except where recognized environmental conditions (RECs) are identified in the context of specific uncertainties) and mandated the collection of new data, such as that associated with sampling and analysis, it could have chosen to do so, but it did not, as Section X of the Preamble language to the EPA Rule itself, proclaims. First, CERCLA, through its 1986 amendments, already included a provision that, in order to qualify for the so-called "innocent landowner defense" to CERCLA, a subset of the CERCLA third-party defense presented within 42 United States Code §9607(b)(3), one must satisfy a number of criteria, including: "the degree of obviousness of the presence or likely presence of contamination at the property, and the ability to detect the contamination by appropriate investigation," (CERCLA §312.31). Thus, we are not "charting new ground" here. The requirement to conduct appropriate investigation has always been a part of the law. Still, there is clearly a renewed emphasis in this regard, and it is reinforced within the updated ASTM E 1527-05 Standard. While it is true that the E 1527-05 version of the standard has now added text directing that an "opinion" regarding additional investigation may be appropriate to complete a Phase 1 ESA and qualify for one of the LLPs to CERCLA, ASTM also makes clear that the environmental professional's opinion regarding additional appropriate investigation "should only be provided in the unusual circumstance when greater certainty is required regarding the identified recognized environmental conditions." 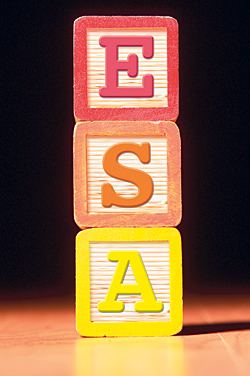 This reference has created a lot of confusion within the industry that uses and produces Phase 1 ESAs, and, since I had a hand in the development of this language, it is only appropriate that I explain what was meant by it. Let's begin with the EPA regulation, rather than the ASTM standard. A review of the rather lengthy preamble that precedes the rule within the Federal Register makes clear that: "Today's final regulation does not require that sampling and analysis be conducted as part of the all appropriate inquiries investigation" (FR Vol. 70, No. 210, Pg. 66,102). EPA states: "We interpret the statutory criterion to require consideration of information already obtained during the conduct of all appropriate inquiries investigation and not as a requirement to collect additional information" (Pg. 66,101). "Nothing in today's rule, changes the nature or intent of this requirement as it has existed in the statute since 1986," (Pg. 66,101). In other words, it is still business as usual within the scope of a due-diligence-driven Phase 1 ESA. With this as background, let's move to the language as it is now presented within the new ASTM Standard. As mentioned earlier, Section 12.6.1 states that the "opinion" regarding the additional appropriate investigation "should only be provided in the unusual circumstance when greater certainty is required regarding the identified Recognized Environmental Condition." The finding of a REC during the performance of a Phase 1 ESA is not at all remarkable. What is atypical is to have identified an additional source of information that is "obvious and appropriate" (i.e., consistent with the CERCLA requirements) but that was not already available through the completion of the standard ASTM Phase 1 ESA task elements (i.e., the unusual circumstance). Bear in mind that, from an ASTM perspective, the primary purpose of a Phase 1 ESA is to support the very narrow CERCLA defense to landowner liability. Thus, it is crucial to the user who seeks such a defense to know whether the defense might be at risk as a result of the level of inquiry. Accordingly, and consistent with EPA's directive, the primary goal of the ASTM standard is to define existing information sources that are normally "obvious" and "appropriate" when conducting such "all appropriate inquiries." My belief is that the current confusion pertaining to the necessity to render an opinion regarding additional appropriate investigation, actually stems from the often misunderstood definition of a REC, which has now been even further complicated by the investigatory opinion element of AAI. There are many subtleties to the definition of a REC. First, it includes "the presence or likely presence of any hazardous substances or petroleum products on a property under conditions that indicate an existing release, a past release, or a material threat of a release of any hazardous substances or petroleum products into structures on the property or into the ground, groundwater, or surface water of the property," (ASTM 3.2.74). This begs the question: Do records that confirm the presence of a leaking tank, for example, require an opinion regarding additional appropriate investigation as far as the requirements for identifying a REC? The simple answer is an emphatic no. If the resultant contamination is clearly documented (i.e., present), no additional investigation is necessary to determine its "obviousness" and, notwithstanding a user who seeks the BFPP defense to CERCLA liability, the remaining CERCLA defenses are no longer available anyway. At that point, the REC is identified with certainty. The mandates of the standard and the specific needs of the "user" may still diverge (i.e., CERCLA LLPs versus business risk concerns), but this is a user issue, not an ASTM matter. As just mentioned, beyond the user's own risk tolerance regarding a REC that results from a leaking tank (for example), there could be a specific circumstance wherein a user who seeks the BFPP defense to CERCLA liability may desire additional investigation. The user may have a continuing obligation to take, for example, reasonable steps to stop ongoing releases at the property in order to maintain their new bona fide prospective purchaser liability protection (42 U.S.C. §9607(r)), and thus additional appropriate investigation is required to understand the release. Alternatively, the user may be required to maintain an existing or recently approved Activity and Use Limitation, including an Institutional and/or Engineering Control that restricts certain development and/or site operations. In such instances, additional investigation may be necessary to fully understand the conditions of a property under certain instances. Nevertheless, the key is that such "continuing obligations" are specifically beyond the scope of a Phase 1 (ASTM Section 1.1.3). In Part 2 of this series (to be published in the next edition of Environmental Protection), I will tackle the more complicated matter of addressing the necessity for such an "opinion" regarding additional appropriate investigation when the REC is the result of a "likely presence" rather than a confirmed presence of a release of hazardous substances and/or petroleum products.